THE CANADIAN PRESS -- WATERLOO, Ont. - Research In Motion co-chief executives Jim Balsillie and Mike Lazaridis sounded a somewhat apologetic note in front of shareholders Tuesday, acknowledging a number of recent troubles that have attracted criticism and depressed its stock value. 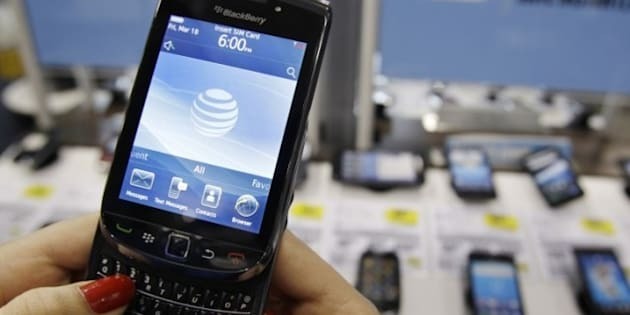 But the heads of the BlackBerry maker defiantly insisted they've got a new slate of smartphones ready to hit the market -- RIM's biggest product launch ever -- that will secure the company's future success. And far from facing an anticipated outpouring of shareholder bile, their comments were received warmly at the company's annual meeting. Lazaridis said RIM plans to launch seven new BlackBerry smartphones running a new operating system in the coming months that is expected to help the new BlackBerry Bold jump a generation in technology. "It may have delayed us, but we are going to come out ahead," Lazaridis said of the company's decision to hold the rollout of the new Bold in order to bolster it to face an "arm's race" brewing among its smartphone competitors. Shareholders eager to hear the company's plans filled some 200 seats, leaving many standing in the crowded room and some spilling out of the doors. Despite a recent spate of criticism and a serious drop in its stock price, Balsillie and Lazaridis were welcomed with applause from what appeared to be a mostly partisan crowd at the meeting held in the barrel-filled headquarters of the RIM-sponsored Centre for International Governance Innovation, a historic converted Seagram distillery in downtown Waterloo. Balsillie said the new smartphones are expected to help the company stay on track to meet its financial guidance for the year. "Mike and I, along with the executive team, are closely managing this transition and have positioned the company for continued future success," Balsillie told shareholders. Some at the meeting were critical of the company's marketing efforts in the face of rivals like Apple -- including one shareholder who brought pictures of the RIM's PlayBook tablet display at a Best Buy store that he said fell short of the rival offerings. "We will continue investing in it and it's only a matter of time -- we will do better," Lazaridis said. He said the company is continuing to build on RIM's reputation for security when it comes to email and added that trials of its PlayBook tablet were under way at more than 1,500 companies. "This includes multiple government agencies and groups from both the public and private sectors," he said, adding that those testing the device are always finding new ways to use it. In a vote of confidence, shareholders re-elected the RIM (TSX:RIM) slate of directors, including lead director John Richardson. U.S.-based proxy advisory firm Glass Lewis had recommended that shareholders withhold their support for Richardson. The meeting was held as the company's management and lacklustre stock market performance faces scrutiny by many investors and analysts. Investor confidence was particularly shaken when RIM cut its full-year financial guidance last month and announced it was planning to lay off staff. In its outlook for its 2012 financial year RIM expects to earn between $5.25 and $6 per diluted share, excluding any one-time charges or share repurchases. That compared with earlier guidance for a profit of about $7.50 per share. RIM stock, which closed up 32 cents at $27.52 on the Toronto Stock Exchange on Tuesday, has been on a steep downward slide in recent months and trades for a fraction of its all-time high of more than $140. The drop has prompted takeover rumours about the company, which were addressed at the meeting Tuesday by a shareholder who asked about a shareholder rights plan to block a hostile bid. Balsillie said a rights plan could be put in place in a "blink of an eye" if a hostile offer was made for the company. "I assure you, if there is anything that will make you sleep better at night that I can do, I'll do it," he told the shareholder. The BlackBerry maker's management structure has also come under criticism as Balsillie and Lazaridis currently serve as both co-CEOs and co-chairmen of the company. RIM avoided a shareholder vote on a plan to split the roles of CEO and chairman before the meeting when it reached a deal with Northwest & Ethical Investments LP to establish an independent committee to review the role of the chairman. Northern Securities analyst Sameet Kanade said setting up a committee just prolongs the need to split up the roles. "We don't think it bodes well for the stock in the short to medium term," Kanade said from Toronto. "It looks nice on paper, but it doesn't really solve the more pressing concerns of who is looking out for shareholder concerns on the board and who is looking out to make sure the CEO or the co-CEOs are taking the right and decisive actions." Kanade said he believes Lazaridis should be the CEO with Balsillie as the chief marketing officer or filling other roles. "Accountability would be more direct with one person running it. There's no one looking out for the shareholders' interests on the board."